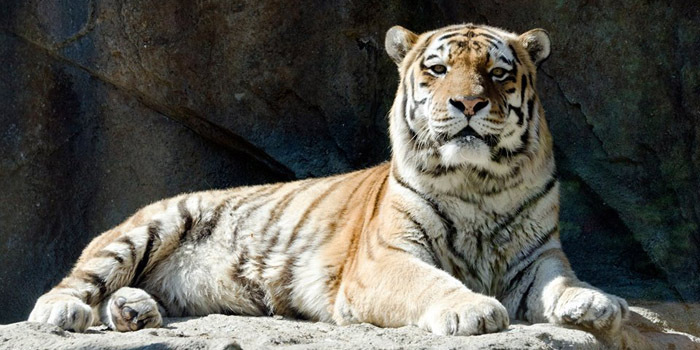 SOUTH BEND — The Potawatomi Zoo in South Bend has announced that Flash, the zoo’s beloved 19 year old Amur Tiger, was humanely euthanized Wednesday morning, Aug. 5, due to health reasons. The zoo says it will be working to acquire more tigers in the near future. After 14 years of serving as a Potawatomi Zoo ambassador, Flash, the Potawatomi Zoo’s beloved 19 year old Amur Tiger, was humanely euthanized Wednesday morning after a period of physical decline due to old age. Flash, who has been receiving treatment for arthritis and suspected kidney disease over the last year, had been under close daily veterinary observation, suffering from severe arthritis and showing symptoms of renal (kidney) failure. As a result, Flash’s ability to move around his exhibit was limited and he had lost significant weight and muscle mass due to a decreased appetite. Amur Tigers are found primarily in the Russian Far East in the Primorsky Krai region, although a few individuals may live in northern China and North Korea. With fewer than 500 Amur Tigers left in the wild, this subspecies is considered endangered due to poaching and habitat loss. Weighing between 400-600 pounds, Amur Tigers, sometimes referred to as Siberian Tigers, are one of the largest tiger subspecies and have an average life expectancy between 15 and 20 years. Accredited by the Association of Zoos and Aquariums, Potawatomi Zoo exceeds the standards for Zoos in animal care and quality of life, conservation and education programs. The Zoo is committed to Amur Tiger conservation and will be working with the Species Survival Plan committee to acquire more tigers in the near future. For more information on the Potawatomi Zoo please call 574-235-9800 or visit www.potawatomizoo.org.